November 2014 Oslo kommune put Hausmannsgate 40 (Vestbredden Vel Vel) out on the open market in an attempt to sell the house to private investors. 2nd of March 2015 they closed the bidding round with 5 offers. Recently they decided to give the house to the highest bidder. The final decision will most probably be decided in the city hall the 10th or 17th of June 2015. We have tried to play by the democratic rules until now, without any luck. The whole sales proces are violating the basic principles in the regulation plan of 2008, that is based on the Local Agenda 21. 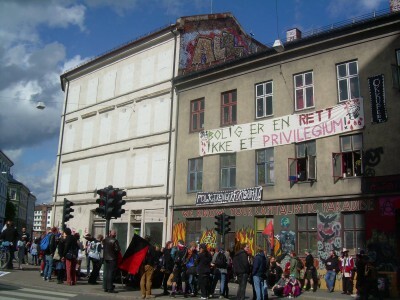 Vestbredden (H40) has been squatted since 1999 and is Scandinavia’s oldest squat. More info on our new webpage: vestbredden.net. We are in big need of support! Come and join us in the struggle – contact us on postbox [at] vestbredden [dot] net. Spread the word – Squat the world!